Did you know? The Battleship New Jersey, docked on the Camden waterfront, is the most decorated battleship in Naval History. 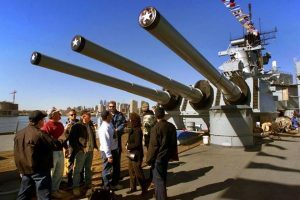 Doubling as a Museum and a Memorial, the Battleship offers daily walking-tours. If you visit the ship, make sure to keep an eye out for Alaina Noland, a Rutgers-Camden graduate and the Collections Manager at the Battleship. The Graduate History Program here at Rutgers-Camden, professors and students alike, are always eager to hear how our alumni are getting on in the post-graduate world. When I heard of Ms. Noland’s success, I could hardly keep myself from asking hundreds of questions. To my excitement, Ms. Noland was more than happy to talk about her position at the Battleship with me, answering my queries with comforting backstory, positivity, and some solid advice for current students whose graduation dates are quickly approaching. Question: Firstly, I’d love to hear a little more about your position at the Battleship. How did you come across the position, and what kind of work are you currently engaging in? Answer: As Collections Manager, I am primarily in charge of the care/exhibition/use our objects collection and libraries. However, we are a fairly small museum so everyone here wears many hats. We also have a completely integrated Education and Curatorial Department, so I also help with education programs, events, and I still get tagged for tour guide duty when they need someone. The big projects on my plate right now are: cataloging our lending library so we can open it to the public this spring, helping design/build a museum exhibit that will be opening June 1st, writing a Collections Management Policy, and writing a tour/program examining the experiences of minorities in the Navy. Q: How did you come across the position, exactly? A: I feel like I have to give a little bit of backstory here. I had no background in Navy/military history and I knew nothing about ships at all when I graduated from Rutgers. After a fairly fruitless job search in the Philadelphia area failed to turn up a job, I expanded my search area and applied for an educator position at Historic Ships in Baltimore. I got that job and commuted back and forth for almost four months…it was a long few months! 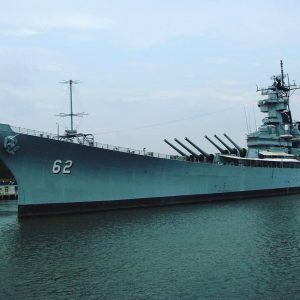 But during that time our site manager in Baltimore moved to Philadelphia to take over as curator on BB-62. He reached out last spring when the museum was hiring tour guides, and that is how I got my foot in the door here. From there I worked my way up to Archivist and then Collections Manager. Q: Do you feel as though your studies at Rutgers-Camden benefitted you, during both your job search and the handling of your current job duties? A: I absolutely adore my job on the Battleship, and I 100% credit my getting it to the skills I learned at Rutgers-Camden. The importance of networking, building industry contacts, and having a varied work experience are all fundamentals that I learned in the graduate program and they have served me well out in the “real world”. Q: So many of the students here, including me, look at your story and see quite the post-graduate success. We can only hope to find a position that we love as you love the work you are doing at the Battleship! That being said, what kind of advice do you have for those of us graduating soon and entering the history-focused job world? A: As far as advice for graduates, try not to get disheartened if you do not find a job right away. I still have two part-time museum jobs almost two years after graduation (I’m also the lead educator at Independence Seaport Museum). Try looking for positions outside of your comfort zone. I did not think I would enjoy archival/curatorial work, but I cannot imagine not doing it now. And make yourself indispensable once you find a position. Always step up when someone asks for help with a project/event/etc. Not only does it make a positive impression but you will absolutely learn something from the experience. Ask questions! You won’t look ignorant, you’ll look interested and that counts for a whole lot. Alaina’s advice offers me a lot of comfort – to hear of the evolution of her positions, how she had to push herself outside of her comfort zone, and how the results bring her happiness and inspire passion is such a positive story, especially with graduation looming ever nearer. And although I haven’t personally stepped onto the deck of the Battleship, Alaina’s passion for her work and her excitement about the Battleship is contagious – would anyone like to take a tour with me? Posted February 5, 2019, by Mckenna Britton in Alumni News. Congratulations are in order for Rutgers History Graduate Matt Ward, who has been published in a printed media source. 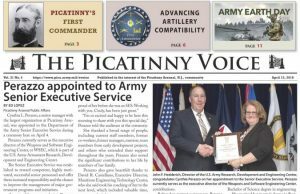 Ward’s article is featured in The Picatinny Voice, the official newspaper of Picatinny Arsenal. He writes of the building’s namesake in an article titled: Picatinny history: Who was Lt. Col. Francis H. Parker? Read his article on page 3 of the paper here. Congratulations, Matt! We wish you continued success. Ward’s article is mentioned on the cover page of the publication, at the top left: Picatinny’s First Commander. Posted April 25, 2018, by Mckenna Britton in Alumni News, What's New?. Matt White, who is now pursuing his PH.D. at Ohio State after earning is MA at Rutgers-Camden, has just published the essay “‘The Cause of the Workers Who Are Fighting in Spain is Yours’: The Marine Transport Workers and the Spanish Civil War” in a new collection of essays from Pluto Press titled Wobblies of the World: A Global History of the IWW. Below is a link for the collection of essays mentioned. Posted October 23, 2017, by Mckenna Britton in Alumni News, Student News, What's New?. I’m working at the Dutchess County History Department (Poughkeepsie, NY) indexing 18th and 19th century court documents for a NYS grant funded digitization project, and at the Rockefeller Archive Center (Sleepy Hollow, NY) as an archival assistant on the reference team. I’ve worked at both places for over 3 years now. Posted April 19, 2017, by Janet Golden in Alumni News, What's New?. Jared Berkowitz, a lawyer who received his MA on our legal studies track, is off to Brandeis for a PhD with full funding. Well done Jared! Posted April 4, 2017, by Janet Golden in Alumni News, What's New?. Page last updated by Graduate History Blog at 2:14 pm September 11, 2018 . This page was printed from http://graduatehistoryblog.camden.rutgers.edu/category/alumni-news/ at 2:55 PM Friday, April 19, 2019.